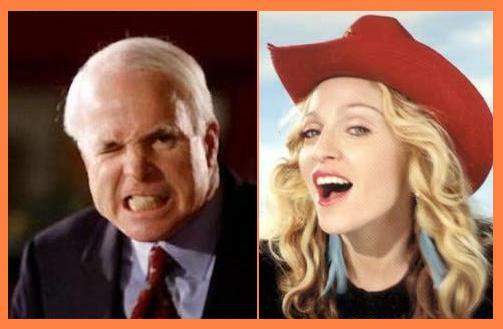 John McCain, who is a presidential candidate, took a swipe at Madonna after the pop superstar seemingly used her latest world tour to compare the Republican leader to history’s most notorious dictators. The “Material Girl” kicked off her “Sweet and Sticky” tour in Cardiff, Wales on Saturday (23Aug08), and featured MCCain in a video segment which accompanied the song “Get Stupid”. In the footage, watched by thousands of fans, the Republican politician’s image was flashed up alongside scenes of destruction, global warming and starving children. Adolf Hitler and Zimbabwean president Robert Mugabe also appeared on-screen. And McCain’s representatives are furious at the singer’s comparisons, stating fans of democratic contender Barack Obama will stop at nothing to smear MCCain’s campaign. The Republican’s spokesman Tucker Bounds revealed: “The comparisons are outrageous, unacceptable and crudely divisive all at the same time. Although Madonna hasn’t publicly backed Obama, she featured the popular politician alongside images of beloved cultural icons, including John Lennon, Gandhi and climate control advocate Al Gore. Meanwhile, Madonna’s tour was eagerly anticipated in Britain, where the pop superstar has made her home, and fans weren’t disappointed.